The dynamic and ever-changing world of social media can be overwhelming…so we thought it would be helpful to simply some key learnings to consider when commissioning video for social media. Most people consume video on their smart phones or tablets. Whether it’s at home, work, on public transport or in a café, no one else around wants to listen to your feed. Whilst some consumers are permanently attached to their headphones most of us are scrolling without sound. Captions are a must to ensure that your videos reach their full potential. Motion graphics. Capture attention with animated text and icons. These can be overlayed on real footage (e.g. interview, face to camera) or purely animated videos. Whichever way, motion graphics are attention grabbing and great for highlighting key messages. Animated videos can be text driven and therefore don’t require captions. Differentiate. If you are producing a series of videos for a campaign, make sure they all have a slightly different visual appearance. This can be done by creating a colour palette up front and assigning each video a different colour opening slide. Therefore, when the suite of videos sit together on YouTube or your website, they won’t appear to be the same video! Find the heart of the story. Whether a story is 15 seconds or 2 minutes long, it must have a pulse that your audience will connect with. To do so, don’t drown your audience with information. Focus on one key message, less is more! Video productions on social media must have relevance, cut through, visual appeal and human connection. 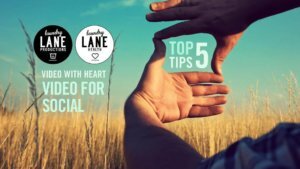 Here are 5 top tips to consider when creating social media videos.